We invite you to share your memories of participating in the festival, listening to performances and interactions with musicians who have graced our music sabha over the last many years. Your entry will appear in the site in a short while. I grew up listening to the concerts conducted by the sathguru sangeetha sabha and the tygaraja trust. 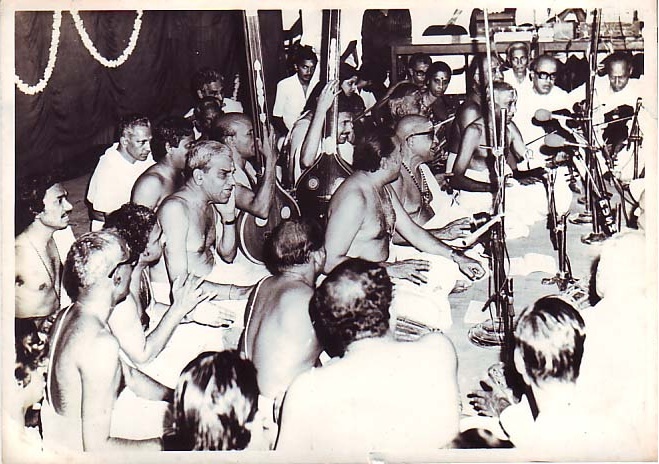 I owe a lot for my abiding interest in classical music to both these organisations.After i started learning mridangam under Pudukkode krishnan and Trivandrum surendran I had the good fortune of playing in the devotees session of the annual tyagaraja festival also. I still remember the concerts by S Ramananthan, BV raman and lakshmanan as well as some enthralling rega elaborations by Semmangui mama as well as his senior shishyan Neyyatinkara vasudevan! The entire programs and the organizing was excellent. Let me congratulate the people behind this job. My house being very close to Padmashri ,the venue for the music festival during 1980-90’s lots of artists who attended the Aradhana festival would stay with us. Vidwans like Sri C.S.Krishnaier ,Trichy Sundaram Iyer , Smt.R.Vedavalli Smt.Mani Krishnaswamy mami, Smt.Savitri Satyamurthy would entertain us with reminences of their concerts in and outside India.It was an awesome feeling to have been able to mingle with such stalwarts in Karnatic music and learn from them. When I was a little girl, I remember listening to Semmangudi mama singing in Padmasri. The concert was progressing well. In between, the singing paused. The mridangam continued playing, but not as though for a Tani avartanam. I could see the great musician on the stage, not far away from me, making some adjustments to his person. He then spoke into the mike “dantham veenu poyi” (translated as “the teeth fell off”) referring to his dentures and then carried on singing.